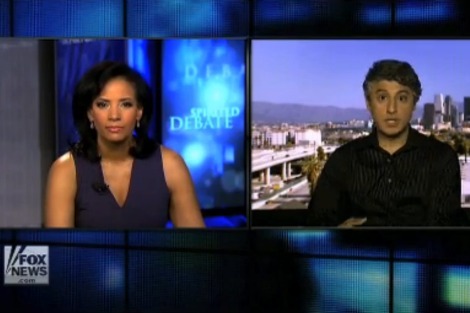 The fallout from the notorious Fox News interview with noted academic Reza Aslan continues. The ten-minute segment in which host Lauren Green repeatedly quizzes Aslan as to why he, a Muslim, 'would be interested in the founder of Christianity' is mind-boggling in its casual religious persecution. Buzzfeed calls it 'the most embarrassing interview Fox has ever done', Slate says it is 'cringe-worthy', and The Washington Post is calling for Fox to apologise to Aslan, who was promoting his new book Zealot: The life and times of Jesus of Nazareth. Aslan has benefited from the publicity, hitting number two on the New York Times best sellers list and number one on Amazon. Green has been roundly criticised for implying that Aslan, despite his numerous degrees in religious studies including a PhD, is incapable of providing an objective and scholarly account of Jesus because of his Muslim faith. While much of the criticism centres on the right of someone to write about a group to which they do not belong, in reality, this goes far deeper than that. The most troubling thing about Green's performance was not that she had an issue with a non-Christian writing about Jesus, it's that she had an issue with a Muslim doing so. In Green's world of privileged western Christianity, a Muslim, even one who has dedicated his working life to studying major world religions, cannot possibly write about Christianity without an ulterior motive. While Fox is not representative of the entire US population, this distrust of Aslan is symptomatic of a culture, helped by movies and TV shows such as Homeland, that still continues to paint every Muslim as a potential threat. Unsurprisingly, Green has no issue with Christians writing about Islam. Her 2011 interview with Barry Van, a Southern-Baptist minister and author Puritan Islam, was spent discussing the stealthy ways Muslims with terrorist sympathies 'can be your neighbours ... they can be in a suburb of Cincinnati ... they can be medical doctors'. But that is how privilege works; it is the assumption that what applies to other, minority groups does not apply to you. Aslan is not alone in experiencing this type of persecution. Huma Abedin, one of Hillary Clinton's closest aides, is the focus of an attack by former Republican presidential candidate and congresswoman Michelle Bachman, who, along with four other Republicans, is accusing Abedin — who, like Aslan, happens to be a Muslim — of having ties to the Muslim Brotherhood. Other prominent Republicans, including John McCain, have denounced the claims. Keith Ellison, the US's first Muslim member of congress, warns of a dangerous step towards McCarthyism. Although The Atlantic has debunked the claims, that hasn't stopped others from jumping on the bandwagon. Abedin is married to Anthony Weiner, the disgraced Democrat candidate for New York City mayor who is currently embroiled in a sexting scandal, leading some Fox News commentators to query the media interest in Weiner when Abedin's connections to 'people who want to kill us' is 'the real story'. It seems a Muslim cannot be in the public eye without being accused of harbouring terrorist connections. When Rima Fakih became the first Muslim Miss USA in 2010, some conservative bloggers dubbed her 'Miss Hezbollah', claiming she had ties to the radical group. Her skimpy pageant outfits were nothing more than an elaborate attempt to fool Americans into thinking she had assimilated, demonstrating that whether in hijab or a bikini, in the eyes of some, a Muslim woman just cannot win. It's a mistrust from which Australia is not exempt as the Ed Husic debacle recently demonstrated. Some Australians just couldn't accept that a Muslim, even one who sits on the Government front bench, can be committed to both Australia and to his religion. Of course, the less devout are not spared either. I would describe myself as, at best, a non-practising Muslim, but that doesn't stop the hostile distrust I encounter when I write on certain issues. When I criticise Israel's treatment of black Ethiopian Jews, readers, purely on the basis of my surname, blithely dismiss me as 'biased' and 'pushing another agenda'. When I write about the practice of 'white-washing' in Hollywood films, I am accused of 'playing the race card' and having 'an ulterior motive'. And when I, as an Australian citizen, lament the direction of Anzac Day commemorations, which I feel have gone from solemn remembrance to glorification of war, furious readers inform me that as a 'foreigner' I have no right to talk about the Anzacs, and demand to know why I 'even came here'. I have come to accept that some people will always regard me with suspicion, but that doesn't make it any less shocking when you see this hostility exhibited so blatantly and unapologetically as it was by Green to Aslan. Sure, Fox News doesn't speak for everybody, but as Aslan himself has since noted, they have created a successful brand based on a widespread fear that already exists in the community. Gore Vidal, amongst others, has explained how Americans need an enemy. Whether it be Communism in the Cold War or Islam after 2001, facts must not get in the way of the belief that they’re out there and they must be stopped. Noxious Fox simply foments conflict, it is not interested in countering ignorance but in furthering ignorance. Anyone with a rudimentary knowledge of Islam knows that Jesus and Mary are in the Qur’an, they occupy an important and privileged place in the history of Islam. Discussion by Muslims about these people is not to be questioned, they’re at the very core of Muslim teaching. Fox should not be taken seriously, except that it must be while it perpetuates ignorance and conflict about these matters. As for scholarly and objective accounts of Jesus, where do we start? Let alone the question of Jesus being the founder of Christianity. Some people lay that claim squarely at the feet of the Apostle Paul, which would have narked the Apostle Peter no end. And weren’t they all Jews? These other questions will not find their way into a Fox interview. I personally know 5 ex Muslims and note that they are not too keen on Islam. They tell me of the hatred of Jews and Christians widespread in their counties of origin and of death threats against them for converting to Christianity. In comparison I find Australia much more tolerant - people can change their faith and not worry about being killed for doing so. Christians are not exhorted to engage in jihad (which is a physical jihad) and welcome BOTH men and women in their churches sitting NEXT TO each other. They do not kill people who convert nor do they advocate war. Mohammed engaged in violence and advocated it. Christ never did, nor did he advocate it. My ex-Muslim friends have informed me a great deal of the reality of the Islamic worldview hidden beneath public 'peaceful' words. Aslan’s book slipped under my radar. It is a sad about Lauren Green. I am more interested in content rather than the bias of “newsworthiness”. Lauren achieved her objective. “Newsworthiness” makes money. Twenty years ago many hadn’t heard of Jihad, Al Quaeda the Koran, Mohammed etc. etc.. This took an existential leap after the Twin Towers. The bombing of the Boston Marathon brought sharp focus on Islamic fundamentalists. The Bali bombing brought it home to Australians. Radical Imam rantings only ‘feed the flames’. Heated tempers of those aversive to massive killing orgies, is understandable. This does not condone it but we need better understanding. What we do strategically and politically is ‘under review’. Don’t judge American too harshly. Many are nursing injured kin and friends. Grief over senseless killings like the soldier in the UK is national. We have much to learn and a difficult road to travel. The place of Jesus and Mary as “ at the very core of Muslim teaching (Silk Road) are incorrect. Stories come mainly from the Gospel of Barnabas. The Koran does give us more details of the ‘Holy Family” and Jesus as a child than s available in the NT. Thank you Ruby. In spite of my name I'm not a Muslim,not that that matters. Can you get your views, your wisdom that is expressed so clearly into the main stream media. Surely you could get some good journalist to interview you. Another old Worrier. Thanks for this item. I was unaware of the interview and just cringe at the ignorance and prejudice it displays. Comments like Skye's display the same kind of prejudice which causes people to selectively cite evidence to justify the antipathy they feel towards the Other. This is the Fox News Religious Affairs Expert? One who doesn't bother to read the book she's reviewing, doesn't bother to research anything else about her guest, and cites chat comments as informed critics in her interview? The only way you can describe this "journalism" is as totally, unbelievably unprofessional. Even for Fox News, the world trendsetter in unprofessional journalism, this is a record breaker. Ignorant Australian anti-Muslims are the sort of people out political leaders are pandering to with their mistreatment of refugees. Nevertheless, Christians are persecuted in many Muslim countries, and I don't regard Skye as an ignorant anti-Muslim. The headline might just as accurately read: "Fox News feeds community fear."